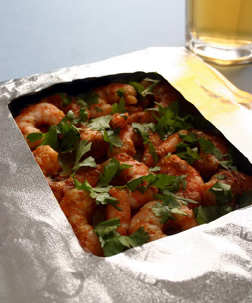 Did you know you could create a prawn curry on a BBQ? Mix the prawns with the curry paste, fish sauce, lime juice and 2 tablespoons of coconut milk in a bowl or straight into Qbag™. Seal by folding the open end twice by 2cm and press down well. Place your Qbag™ over a hot barbecue with the EasyView Window facing up. Cook for 6-8 minutes. Then peel back the window film to pour in the remaining coconut milk. Bring to the boil for a few more minutes. Then add the chopped coriander and serve. On the BBQ: Pre-heat BBQ to HOT. Cook for 6-8 mins then pour in the rest of the coconut oil.